Artists and Arts Businesses - be part of the creative community! 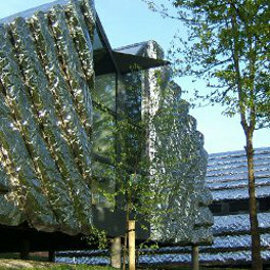 Designed by Thomas Heatherwick, one of the UK's top designers, the Creative Studios Project houses sixteen studios designed to accommodate a wide range of creative businesses, arts development agencies, artists and craft workers. The mix of businesses is an outstanding feature of this development with both new and established occupants interacting together in a creative and stimulating environment to realise thier economic and creative potential. The Studios are adjacent to Aberystwyth Arts Centre on the University Campus. 18 single storey studios (DDA compliant) which average 35sqm each and make use of natural light with skylights and glazed ends to provide views over the Arts Centre. Each studio contains a disabled toilet, kitchen area and foyer. Parking is available and there is pedestrian access to the facilities of the Arts Centre including its performance and exhibition spaces, award winning cafes, bars and shops.